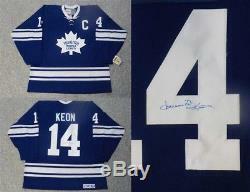 SIGNED DAVE KEON TORONTO MAPLE LEAFS 1967 JERSEY. This is a Dave Keon Toronto Maple Leafs 1967 semi pro jersey, made by CCM, size men's XL. The autograph is signed in blue Sharpie on the 4 of his number 14 on the back of the jersey. This version of the Toronto Maple Leafs jersey was first used during the 1967 Stanley Cup Playoffs. It was also done in honor of Canada's 100th birthday. All letters and numbers are stitched on. This jersey is new with all of the tags. All COAs are from my company. 5% GST for the rest of Canada. 13% HST if picked up. Canada Post Xpresspost - USA. Canada Post International Parcel - Air or Canada Post Xpresspost - International. Powered by SixBit's eCommerce Solution. The item "SIGNED DAVE KEON TORONTO MAPLE LEAFS 1967 JERSEY" is in sale since Thursday, October 11, 2018. This item is in the category "Sports Mem, Cards & Fan Shop\Autographs-Original\Hockey-NHL\Jerseys".